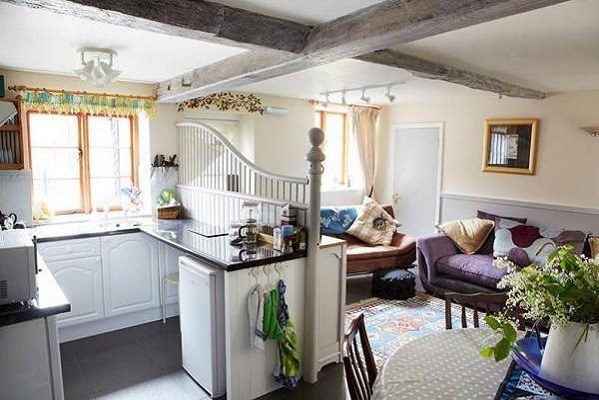 An open plan living/dining room with comfortable sofas, unique screen-printed soft furnishings, a fully fitted kitchen, a separate downstairs toilet and a separate downstairs shower room - easy access although one step up to the toilet. 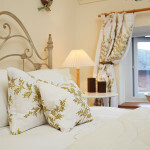 Crisp white Egyptian sheets, fluffy towels and a quality mattress ensure you sleep well in our four poster bed. 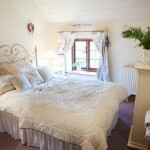 Fresh flowers and toiletries to help you feel spoiled and ensure you get a great nights sleep. 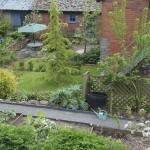 Each cottage has its own private herb garden. 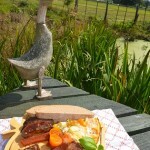 Guests can also wander around the extensive farmhouse gardens and grounds and enjoy using produce from the kitchen garden. 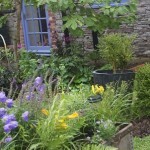 Always fresh garden flowers in the Cottages. Usually home-made treats - sometimes chocolates. Special arrangements made for anniversaries and birthdays - just ask us in advance and we'll do our best to delight you. 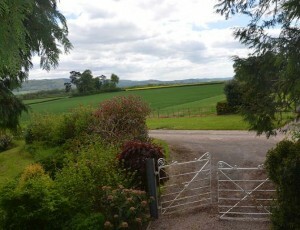 Visit Herefordshire and stay with us! 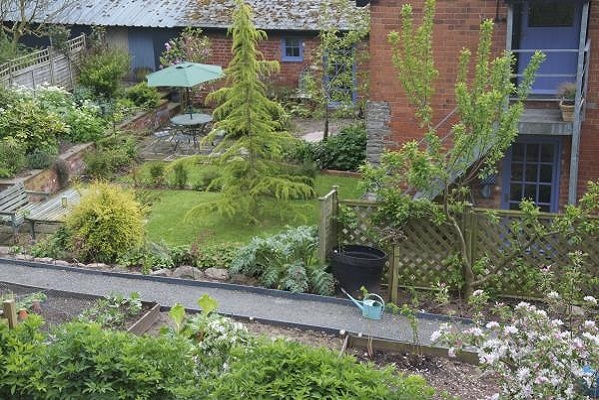 There are many beautiful and peaceful places to visit in Herefordshire, you just need to know where to look and who to ask for inside information and secret places. 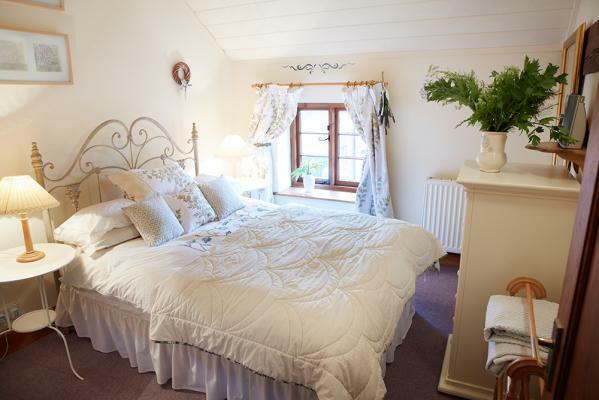 Spend your precious time off with us in our bed and breakfast or self-catering accommodation. Upper Newton Farmhouse is on the edge of the village of Kinnersley, perched just on the Welsh border. 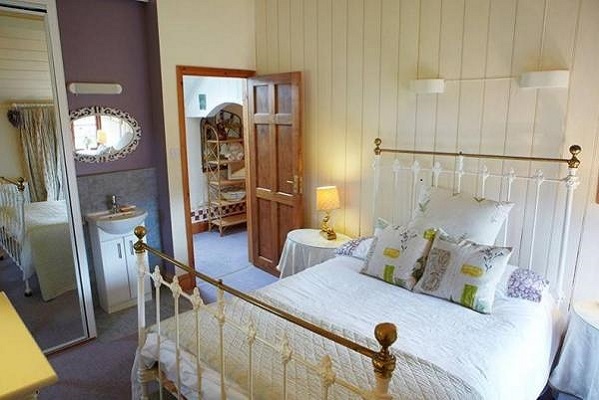 It is a mere 10 miles from Hay-on-Wye and 15 miles from the Cathedral market town of Hereford. The river Wye is just 2 miles away and an ideal destination if you enjoy canoeing, fishing or just idling and paddling with a picnic. Alternatively you could wander around the farm trail, through the bluebell wood, through the apple orchards down to the brook. 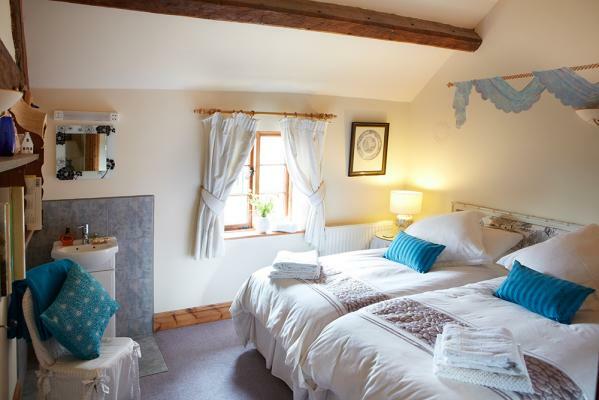 We pride ourselves on providing comfortable accommodation. 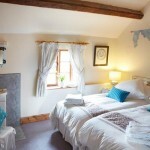 We have two cottages available plus a bedroom in the main farmhouse. 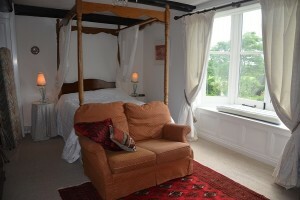 Exclusive use of the cottage: If you book a room in one of the cottages we will not take a booking for the other. You will have complete privacy. 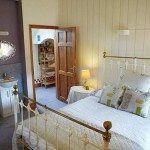 You decide whether to cook: The cottage rooms can be booked either as catered or self-catering. 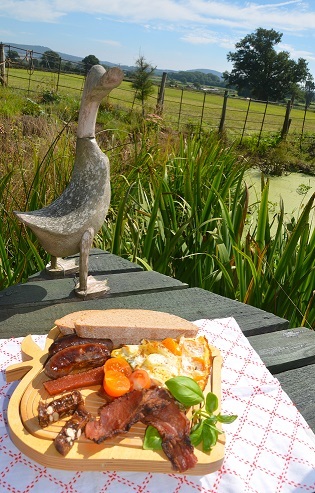 You can cook for yourself or take advantage of Pearl’s award-winning farmhouse breakfasts served in the Jacobean farmhouse. 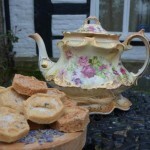 If you have a birthday or special celebration we delight in little surprises for you (with a little warning!). 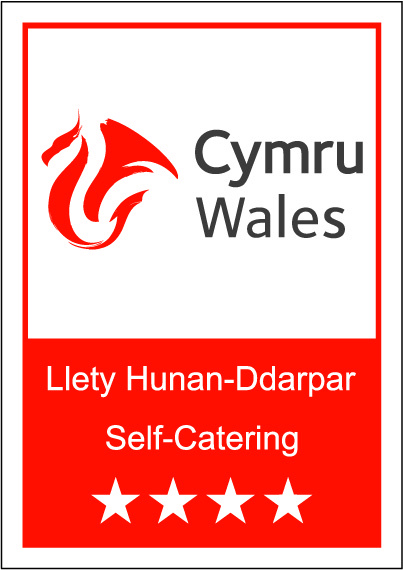 We can cater for different diets - just make sure you let us know! 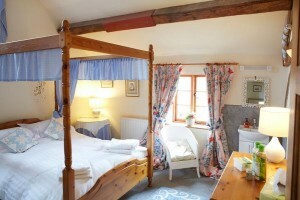 Our guests stay in one of two cottages: Apple Bough Cottage and Chess Cottage. 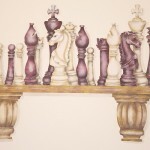 each has a slightly different feel, both are contemporary with character. You can also bring friends and family and book both. 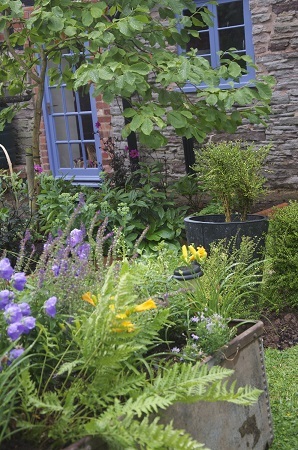 Both cottages have access to the farmhouse garden to wander around and the kitchen garden can be used as a source of ingredients when you want to cook. 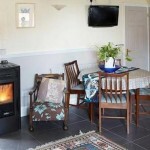 The cottages have similar facilities. 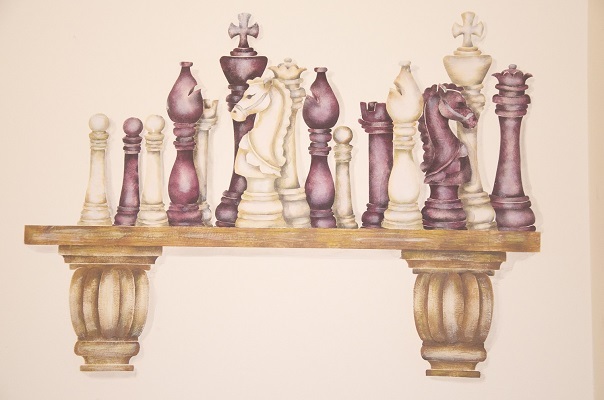 The main difference between them is that the double bed in Apple bough is a four-poster and the twin beds in Chess can be zipped together to make a king-size double. 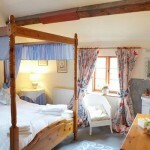 The beds are comfy, the towels are soft and the linen is pure cotton and crisp and white. 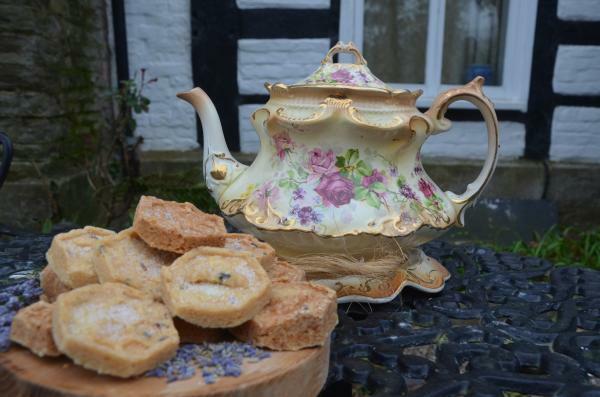 English garden flowers are always in the rooms and scrumptious little cakes or home-made biscuits with tea and coffee are complimentary on your arrival. 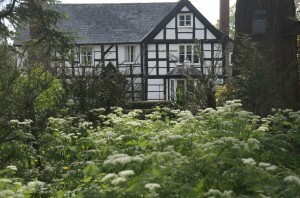 Very exciting news – the Wye & Usk Foundation have been to check our good farming practices and environmental impact. They provided a detailed report which identifies (what we already knew) a beautifully clean Kinnersley Brook. Mayfly nymphs, freshwater shrimps and caddis fly larvae were all observed and evidence of otters was found. This was all in early April. The Gnome patrols are obviously working. 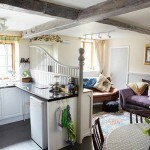 The cottages both have free access to wifi. 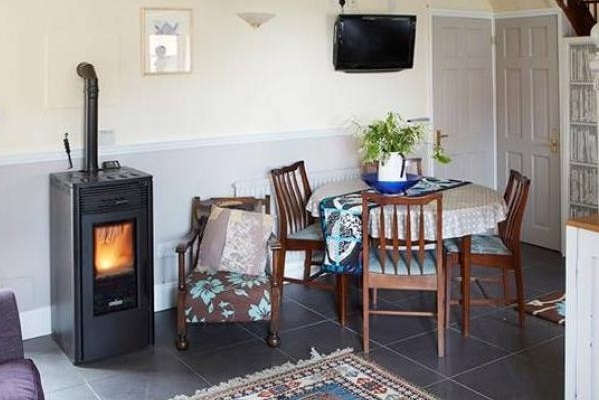 However, please bear in mind you are renting a rural property in an area of poor broadband coverage and therefore access to the internet may be limited at times.